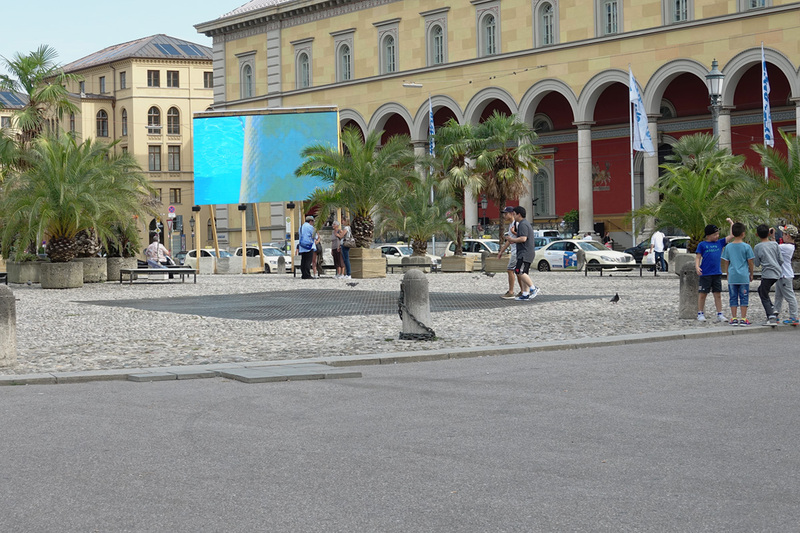 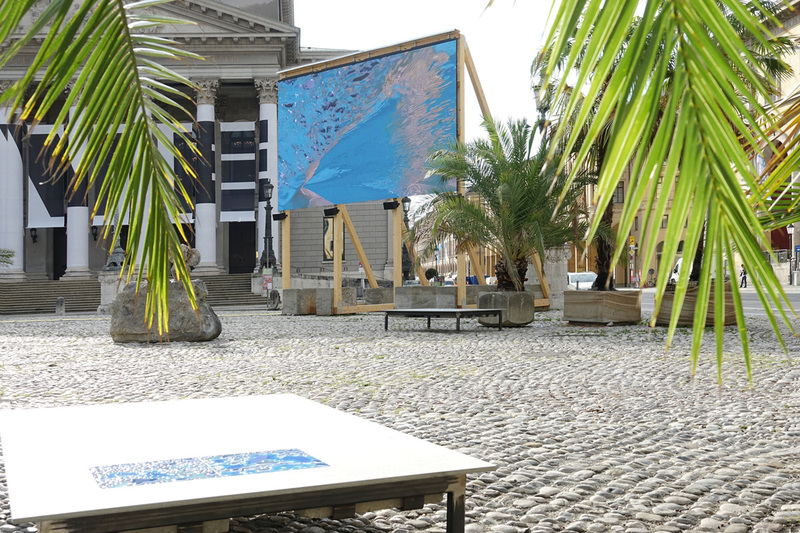 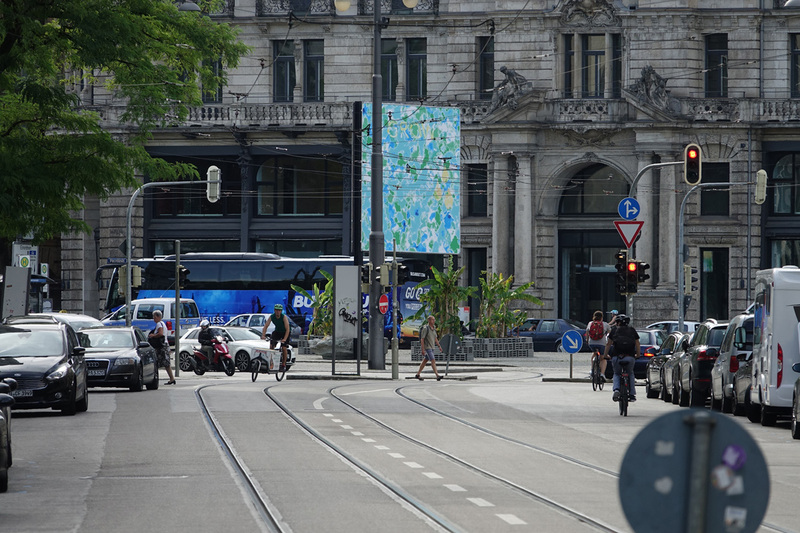 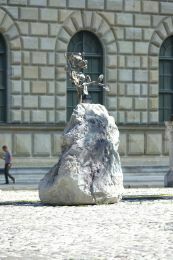 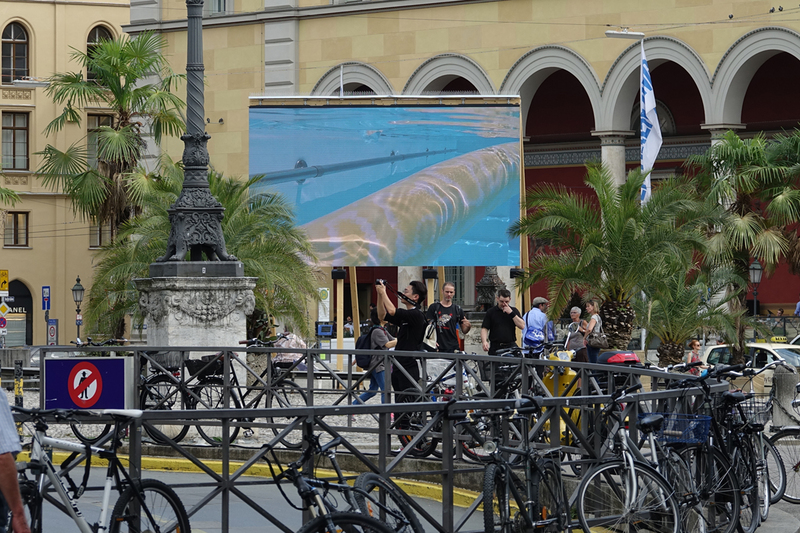 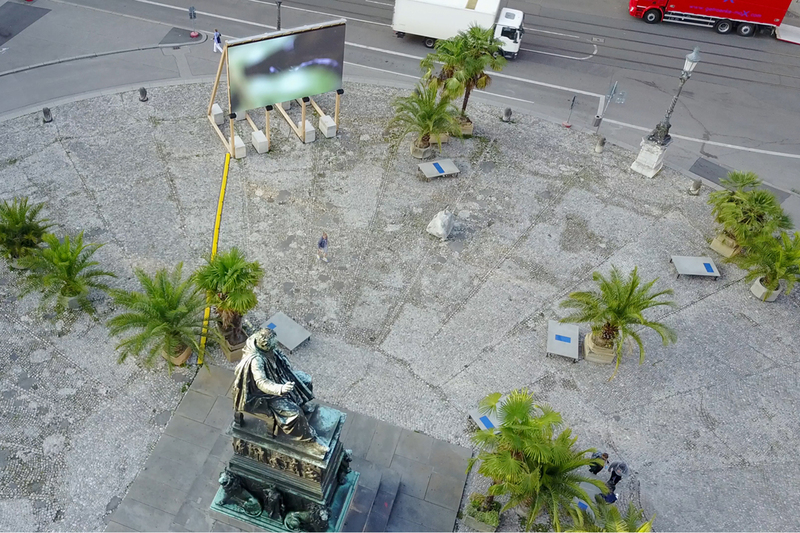 Over a period of four weeks (21/7 – 21/8/2017), multimedia installations grow on three city squares in Munich: Odeonsplatz, Max-Joseph-Platz and Lenbachplatz. 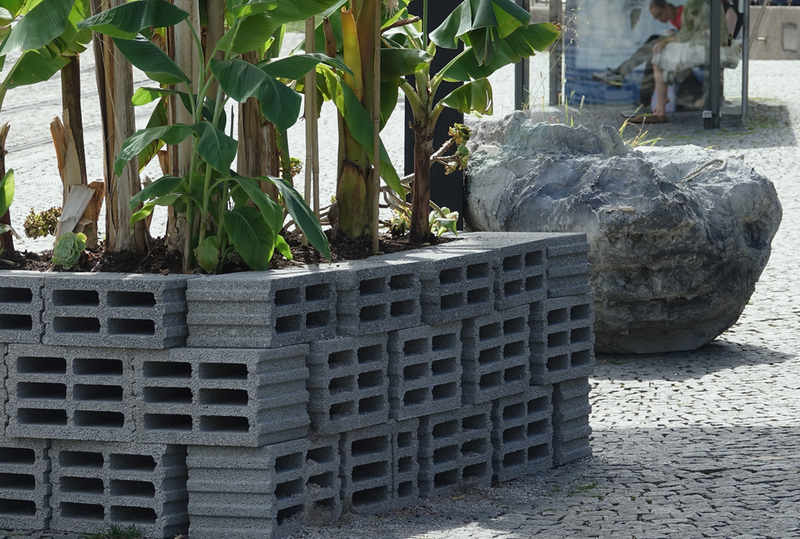 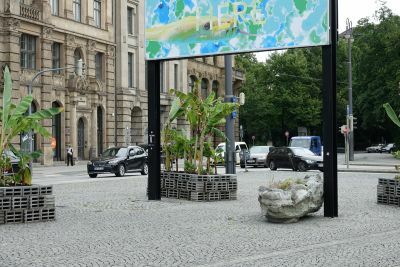 In this urban exhibition concept, tropical plants, sculptural works and intelligent materials are arranged in hybrid formations, an amalgam that forms an unfamiliar and at the same time experiential biosphere. 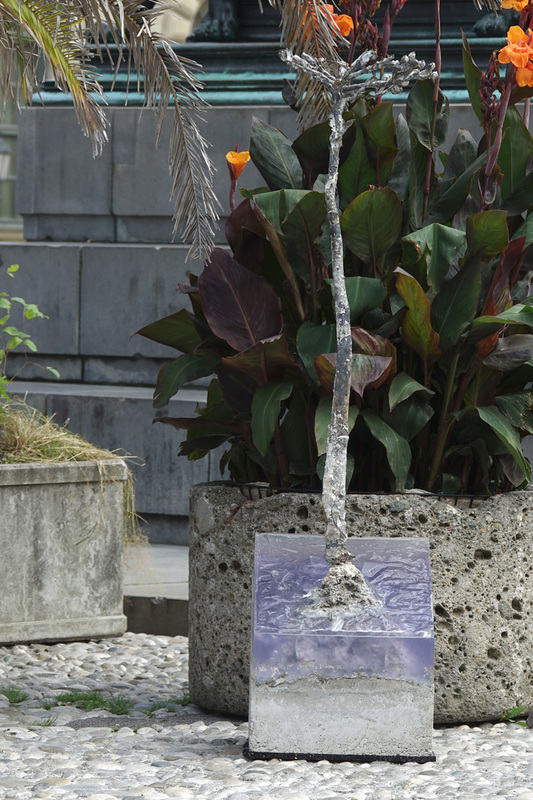 Susi Gelb’s process resembles an elaborate root system that has no linear narrative and no hierarchies. 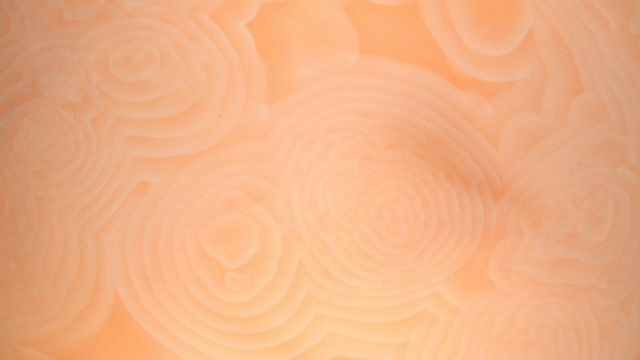 Rather, this network consists of many cross-references that are grounded in a number of different areas of expertise, knowledge and research. 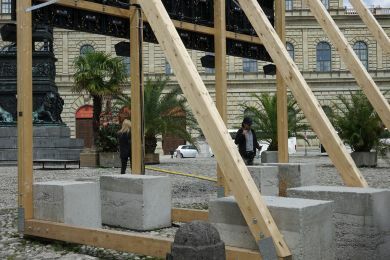 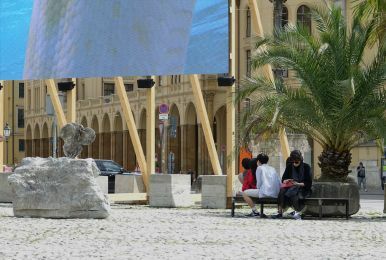 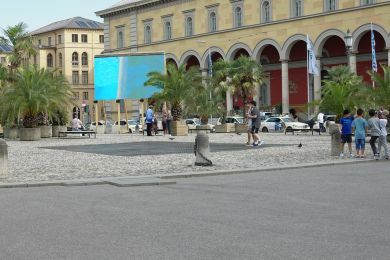 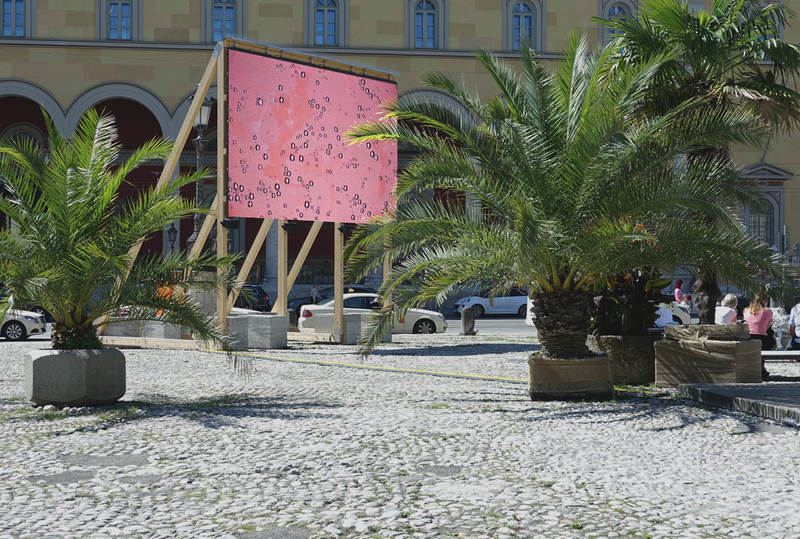 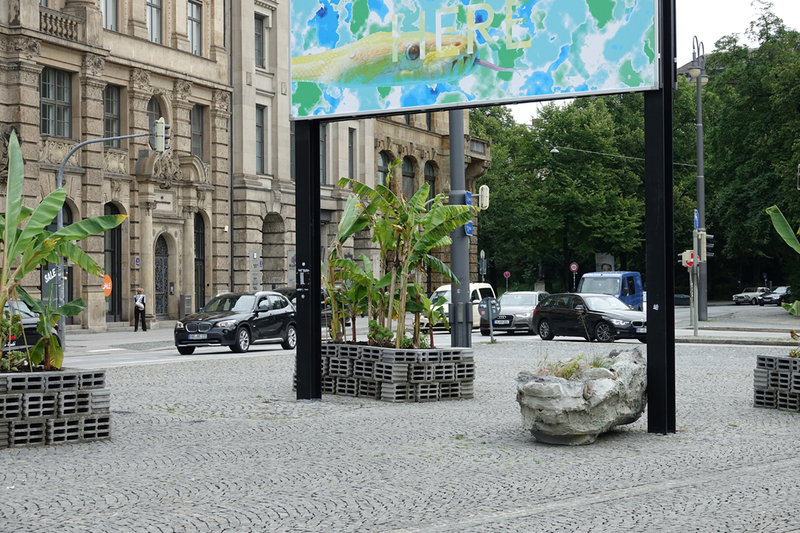 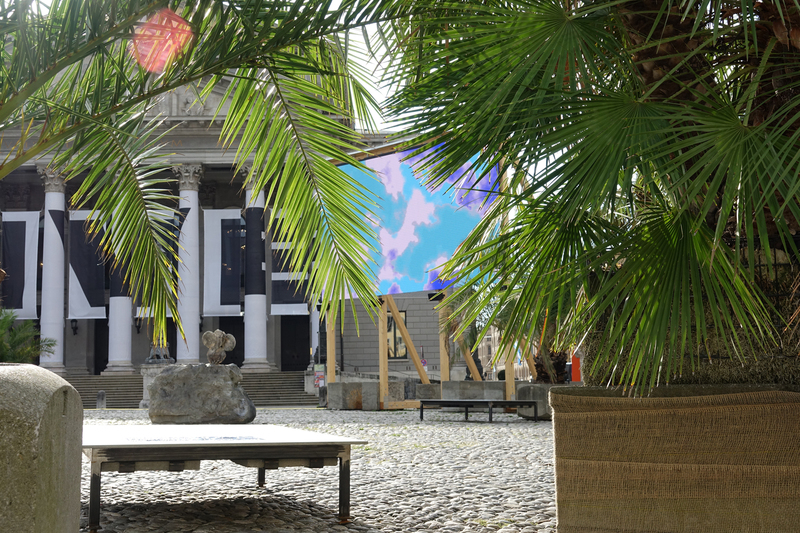 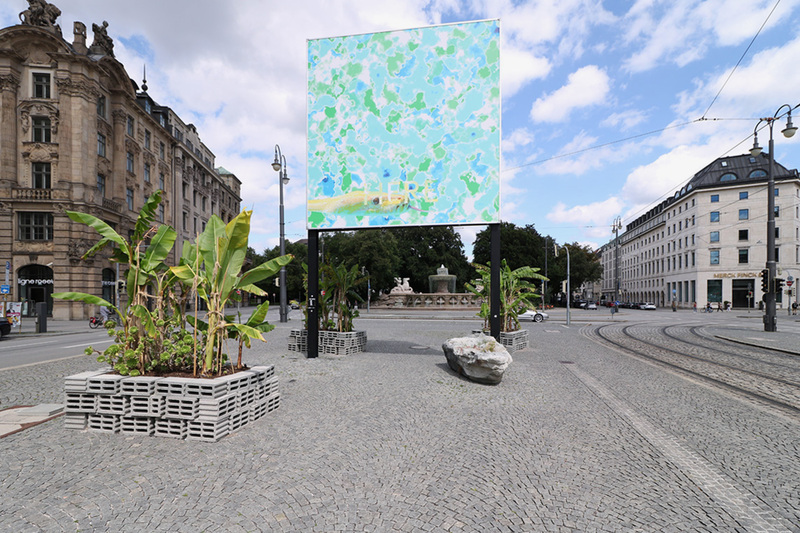 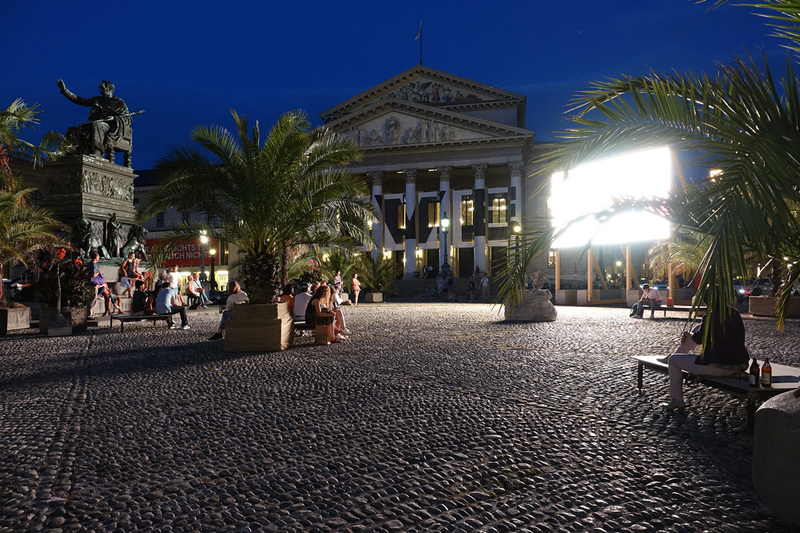 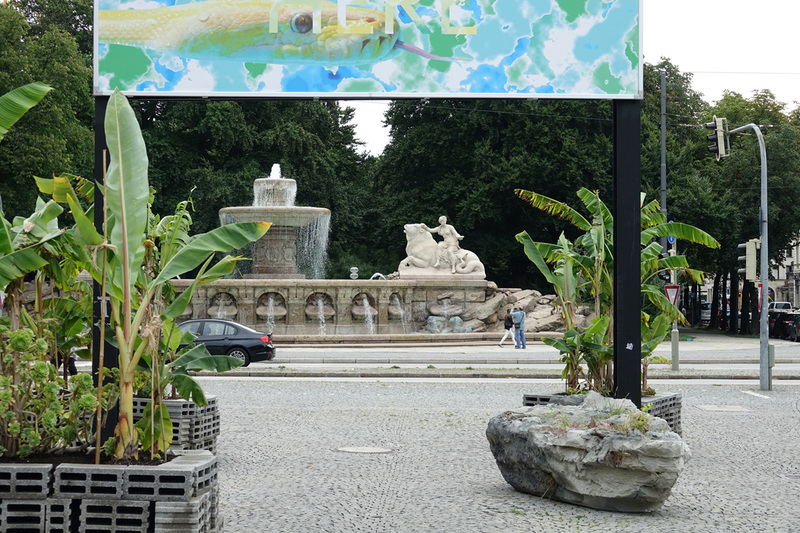 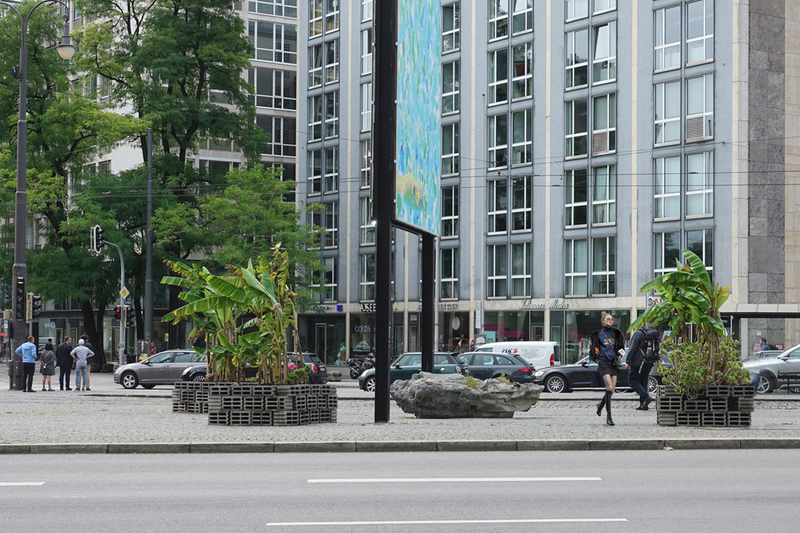 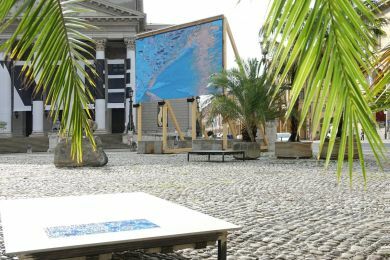 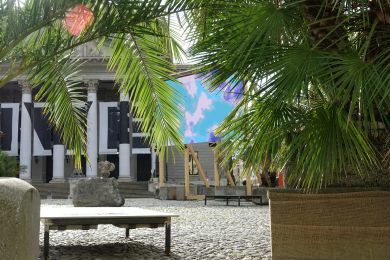 In the middle of the vast and otherwise barren square in front of the Munich Opera House grows a tropical installation by Susi Gelb, with an oversized LED screen, sunbathing platforms, sculptures and exotic plants. 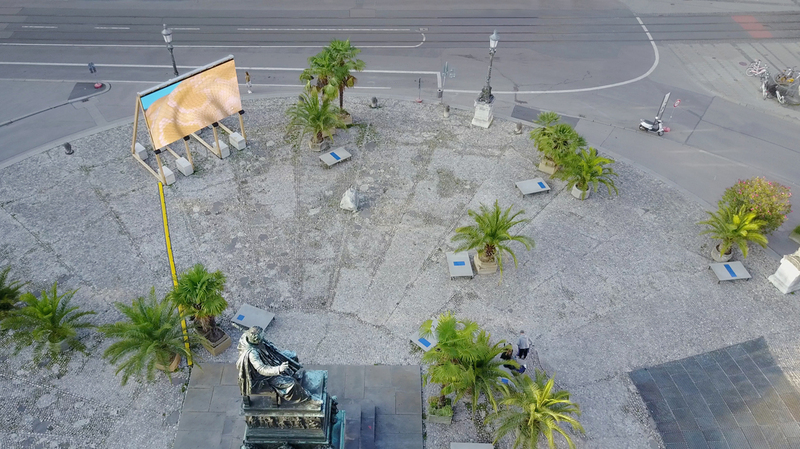 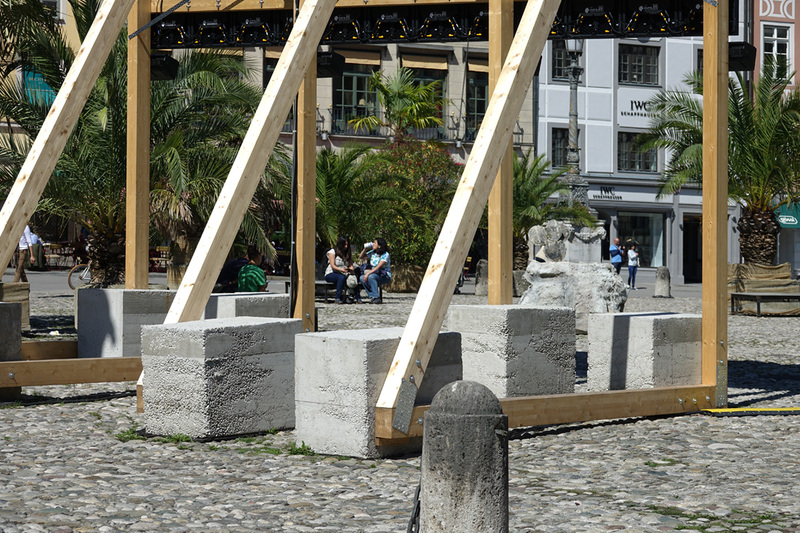 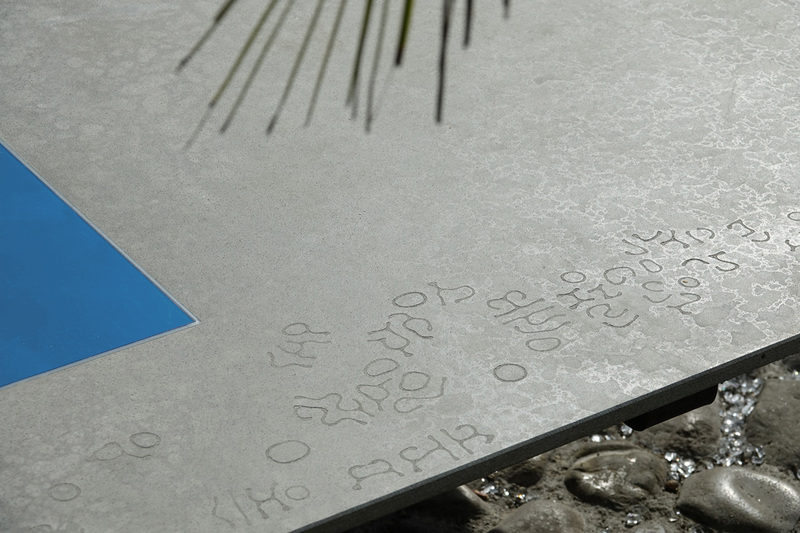 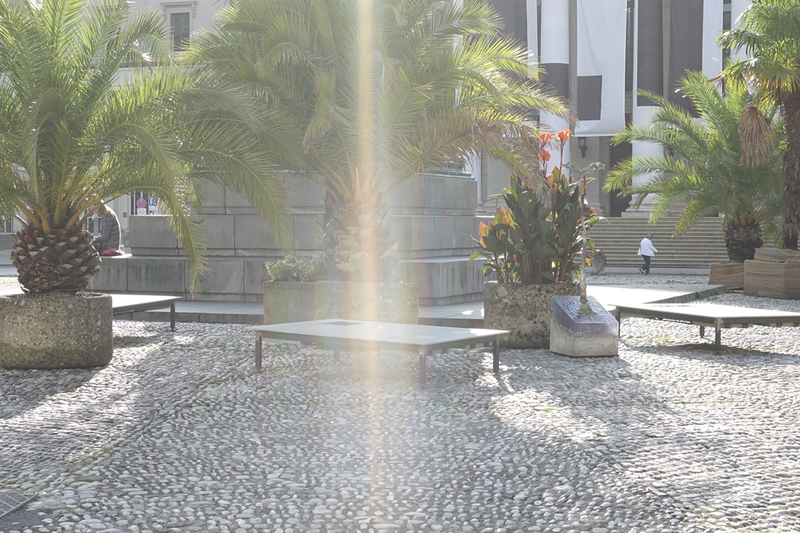 A film made specifically for the project is at the heart of this urban intervention. Played as a loop on the LED screen, the film carries us off to Susi Gelb’s world of research. 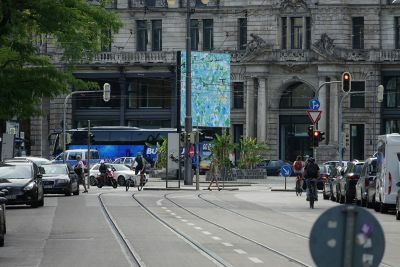 The led wall acts like a window, a means of hyper vision and time becomes space: The consistency of materials shown in the moving images as well as the perception of time seem to be slightly unreal, startling. 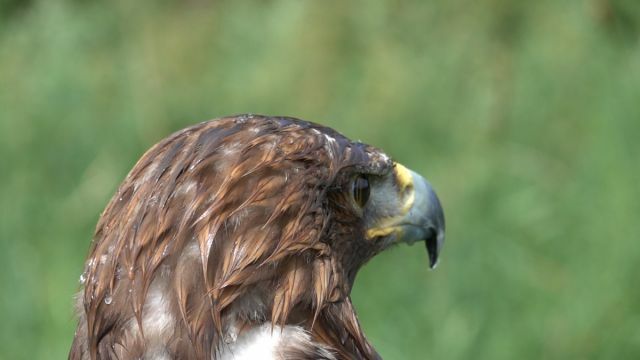 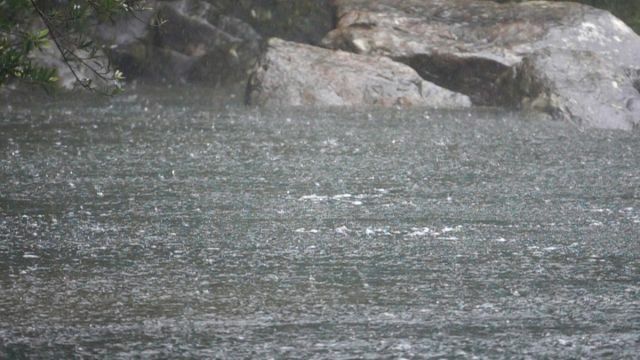 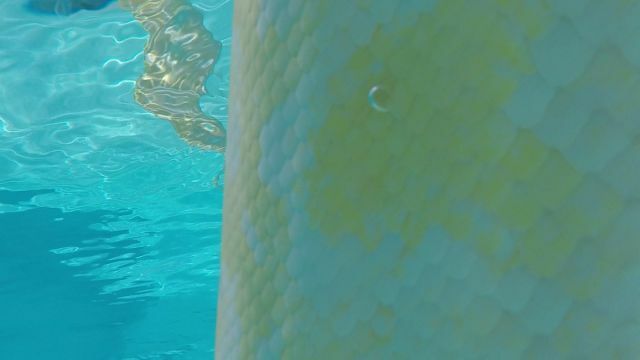 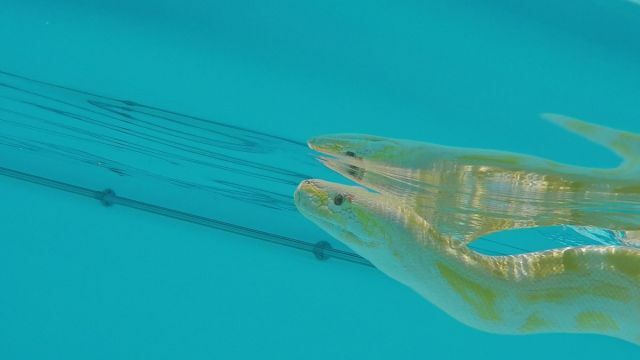 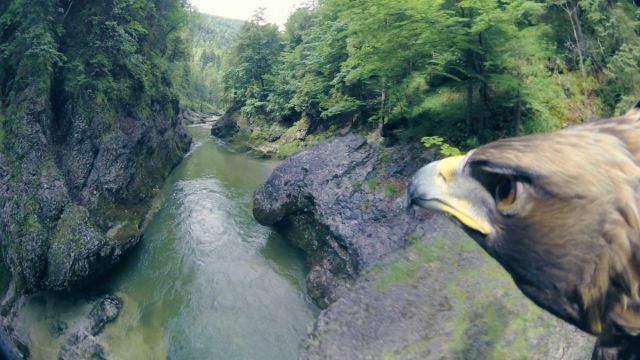 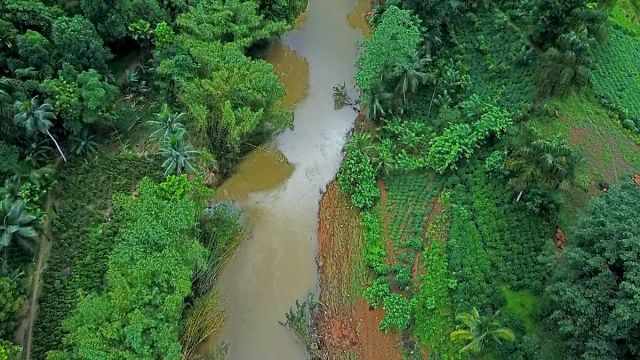 An eagle-cam confronts us with the animal’s point of view; underwater footage, strange close-ups or high-speed material that is extremely slowed down increase the unsettling but immersive appeal of the video work. 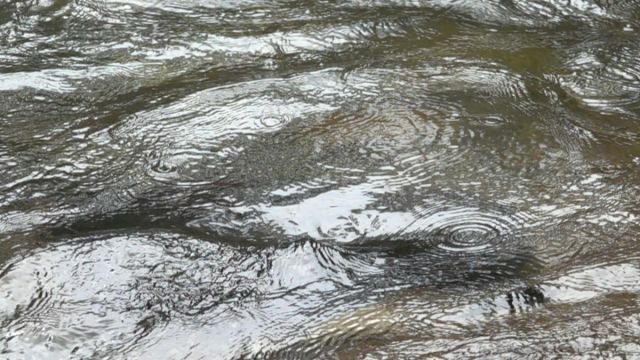 It‘s a flow that tags you along. 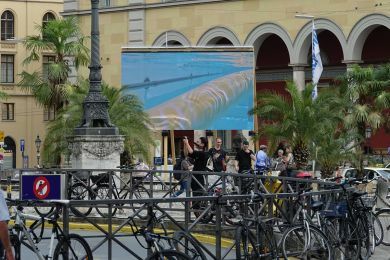 The atmospherical soundtrack was synthesized and elaborately produced by the Greek musicians NOUVELLE and FondaMentalism with analog and digital sources, creating an additional experience of constant flow. 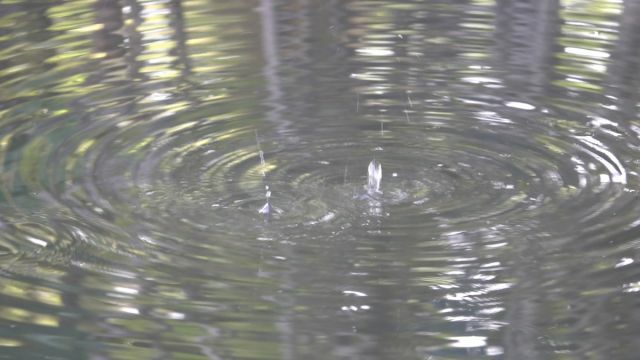 Panta rhei ~ all things are in flux in this time-based medium ~ a shimmering drop of water on the head of an eagle that lifts off and flies through a jungle to a stream ~ gurgling water in slow motion ~ the oscillating, perpetually changing colours and patterns of the Belousov-Zhabotinsky reaction ~ a snake swimming in clear turquoise water ~ crystallization processes ~ a lizard runs across a keyboard ~ reaction diffusion ~ patterns on the reptile skin. This is where we become explorers on a visual expedition. 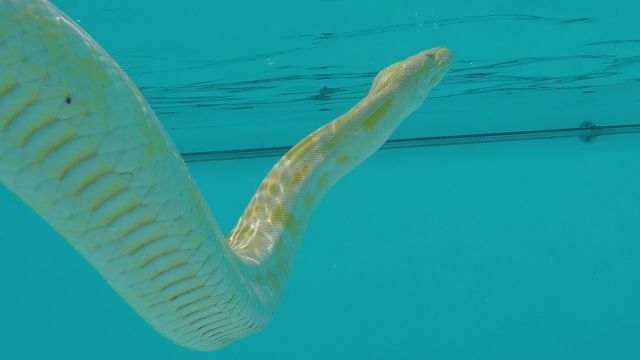 Flowing, mysterious and seductive, an albino snake takes us to scenes that are ominous and almost unreal. It is an inspiring exploration of the nature and the animal world, in which metaphysical processes from alchemy and science are shrouded in a pulsing strangeness. Susi Gelb’s environments conceptualize nature as a medium and question the existing categories of “natural” and “artificial”. 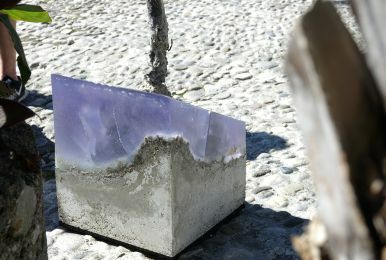 The artist creates a living setting which has, to a certain extent, an independent existence: Smart materials change their properties of their own accord and adapt to the changing surrounding conditions. 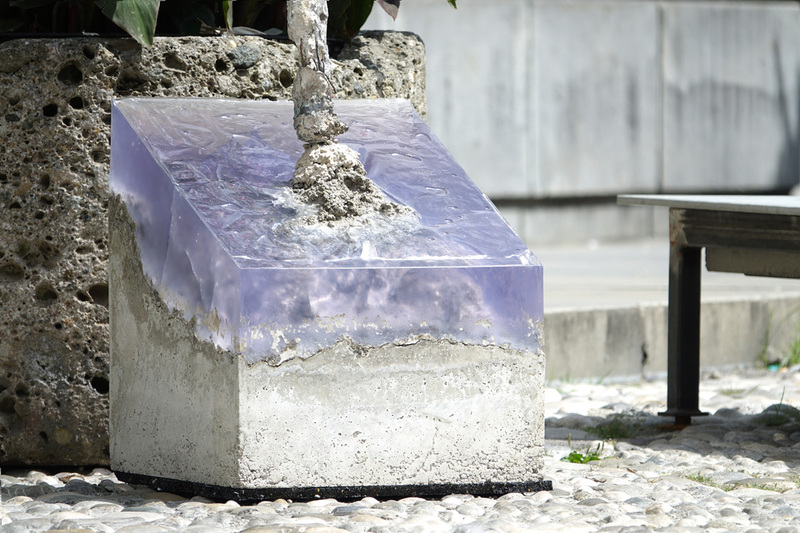 In the process, the intelligent materials come to form a second natural cosmos. 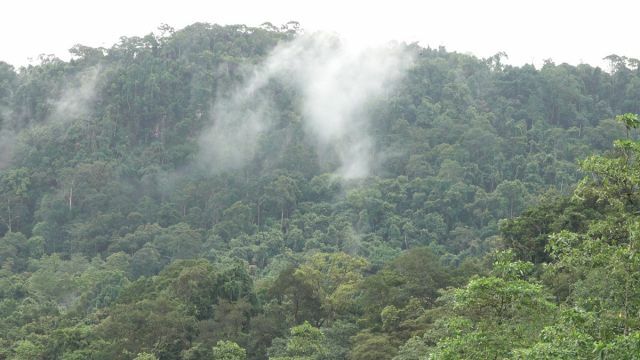 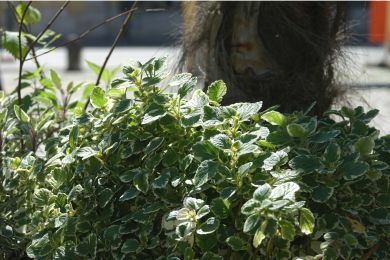 The processes and energy conversions at work in the material begin to communicate to the plants, animals and human beings around them. The concrete loungers are inlaid with thermochromic tiles. 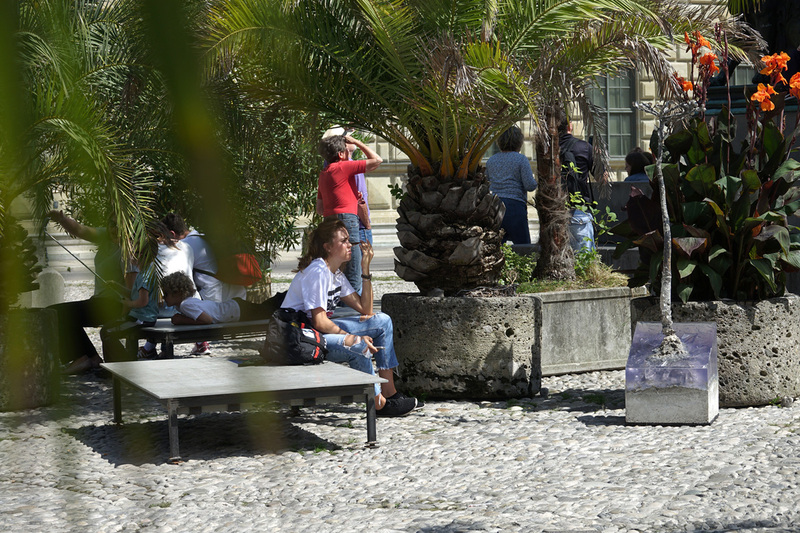 The changing colour spectrum echoes the heat of visitors and the sun. 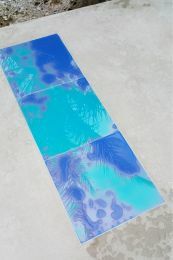 This visual response is created from a liquid-crystal layer embedded between the tiles’ layers of glazing. 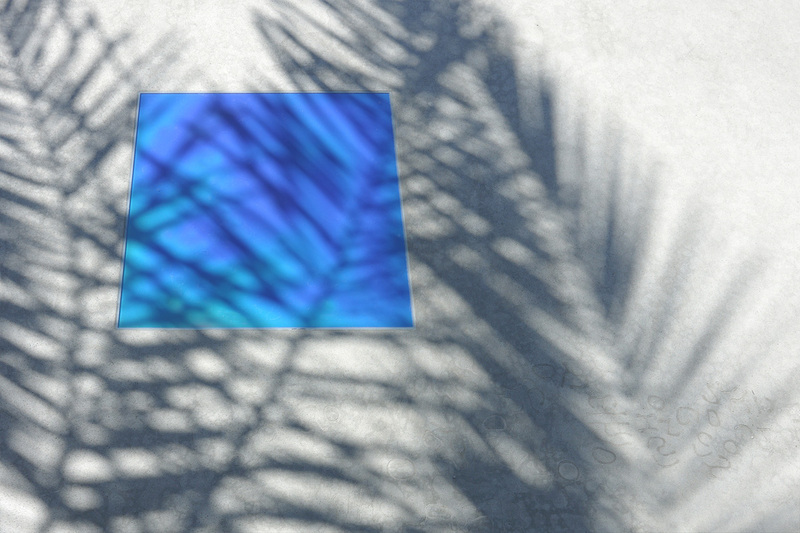 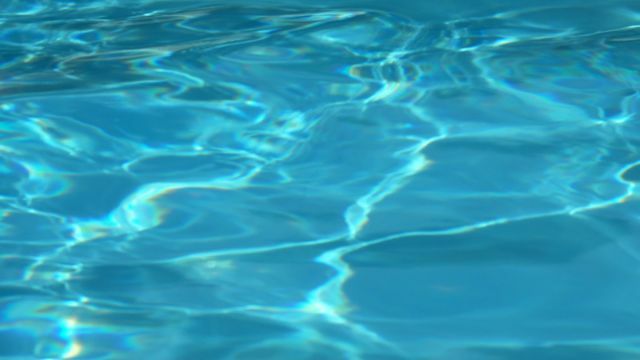 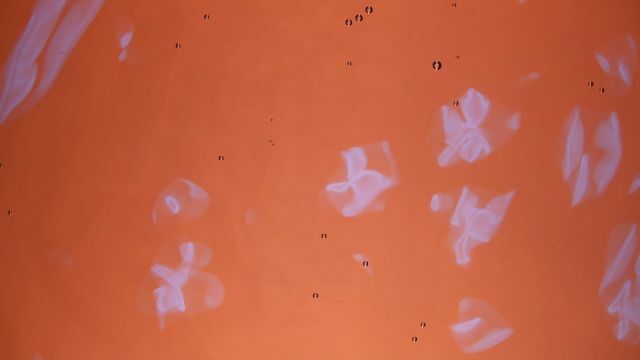 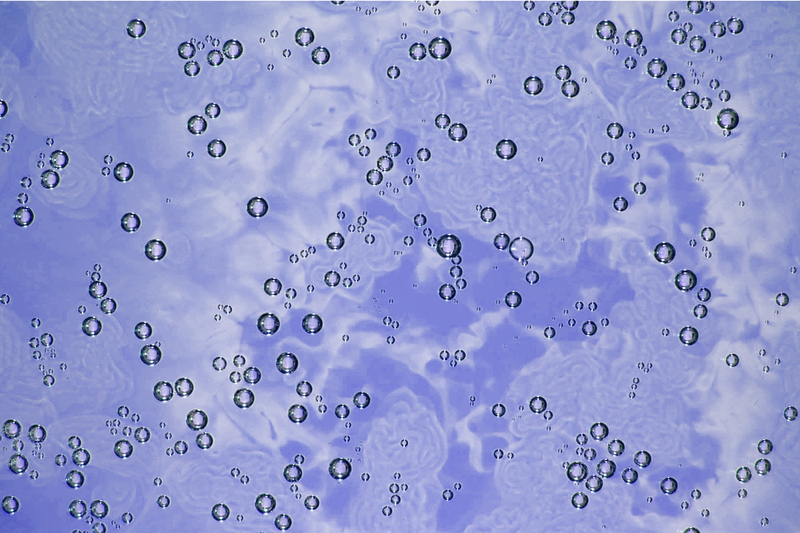 Dependent on the temperature different liquid-crystalline phases develop inside the tile, each with a selective reflection of certain wavelengths. 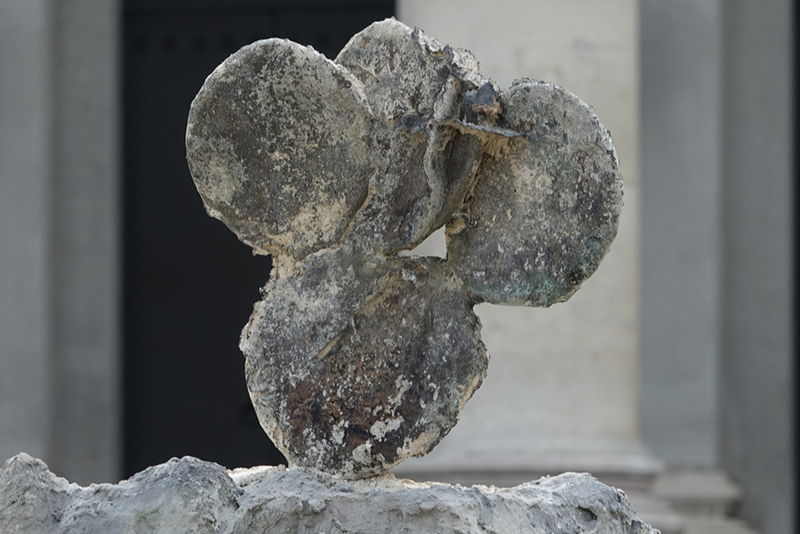 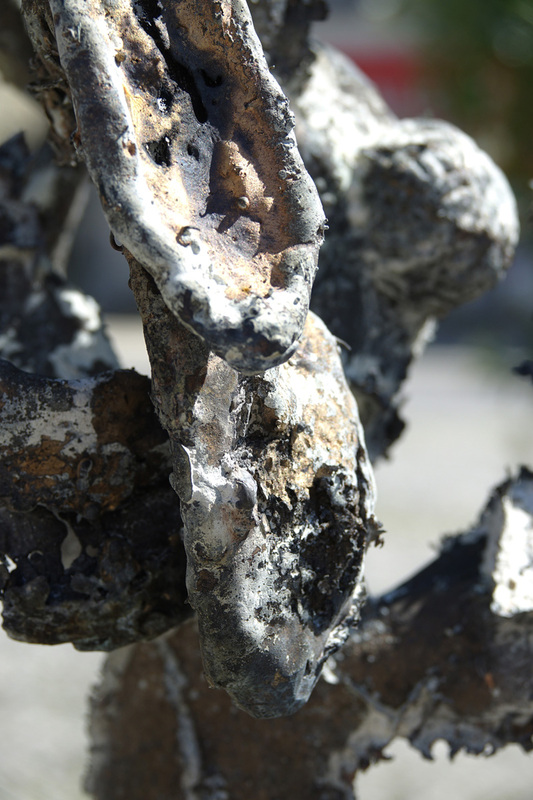 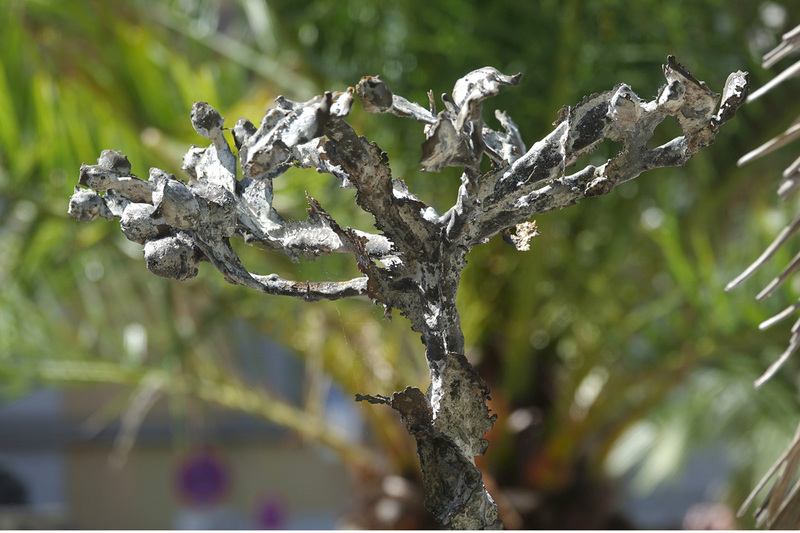 Susi Gelb‘s environment also features petrified prickly pear cast in bronze. 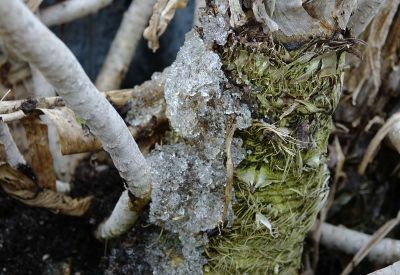 In the process of casting the organic plant material, the surface of the fleshy cactus skin crystallized in some places. 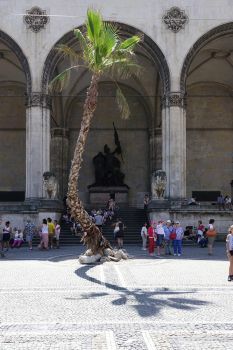 The lopsided palm tree with its fan-shaped leaves in front of historical Feldherrnhalle is real. 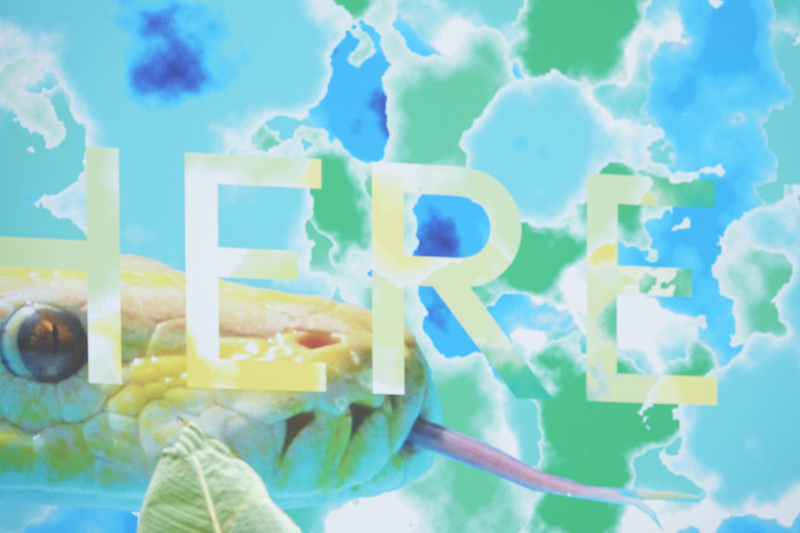 It’s alive and comes from a southern biosphere. Like a dandelion, the palm tree struggles through asphalt and paving stones. Washingtonia robusta is native to the oases of the desert. Palms grow at an angle to adapt to their uncertain surroundings. 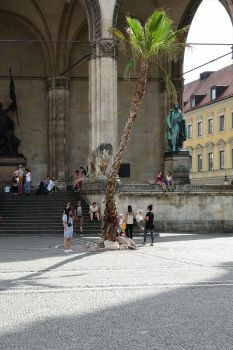 The root bale of a palm tree is relatively small and compact, allowing it to connect to its urban environment in a very small space. 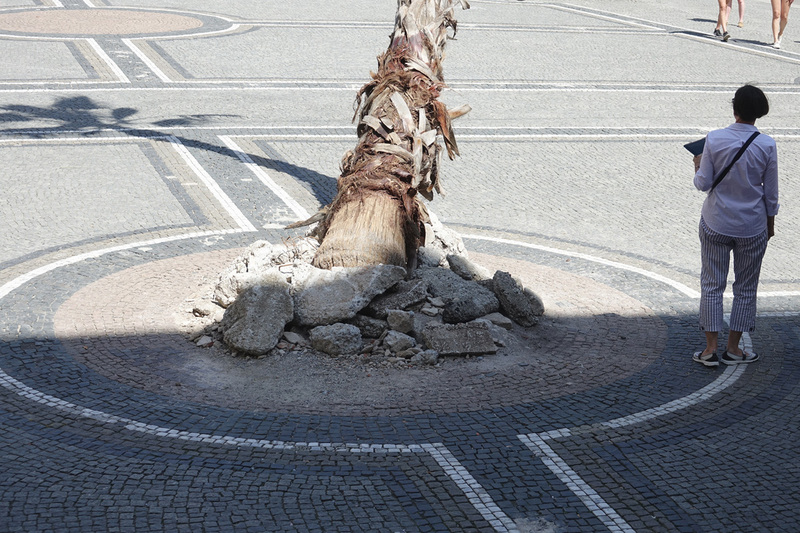 On the opening night some of the sand and heavy debris that surrounded the palm tree mysteriously started to move. 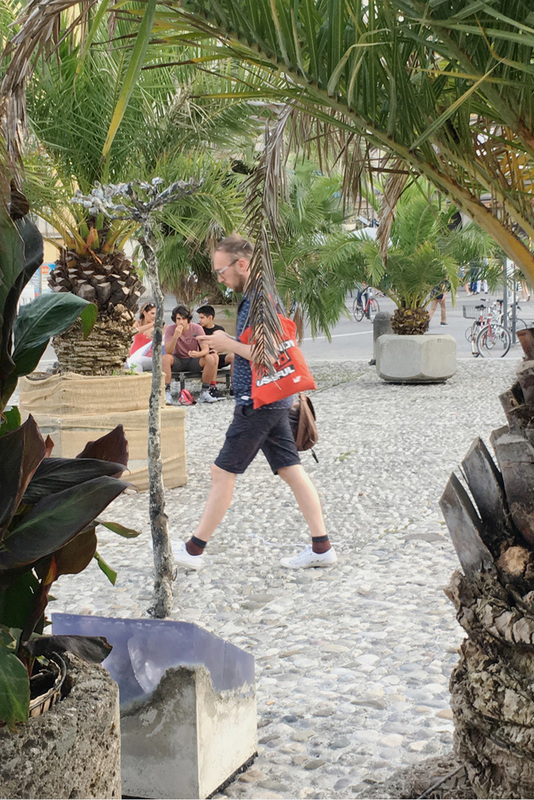 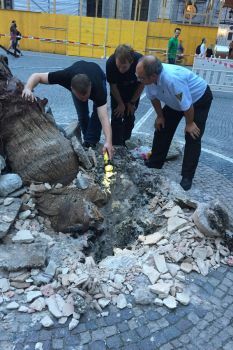 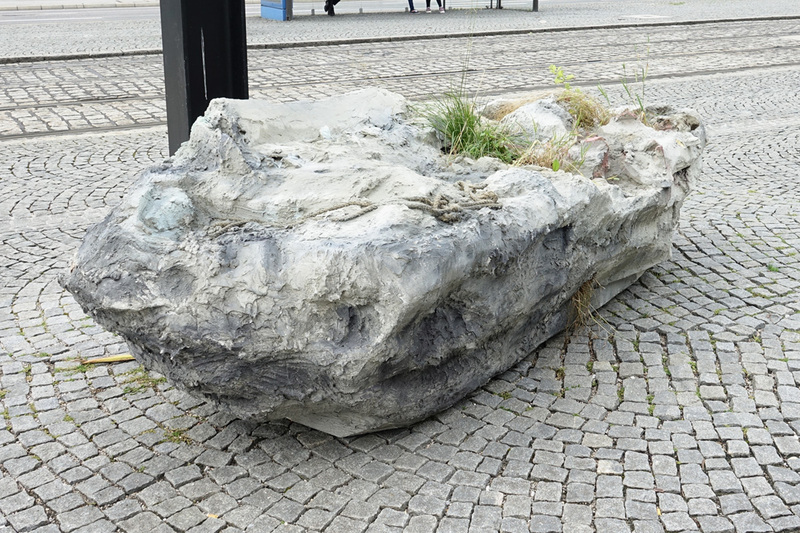 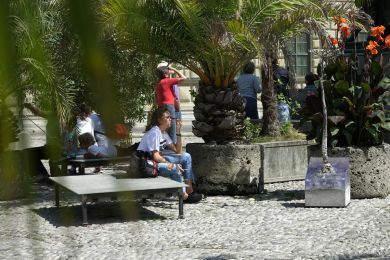 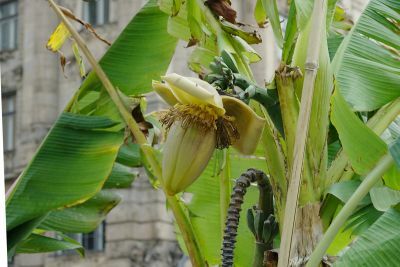 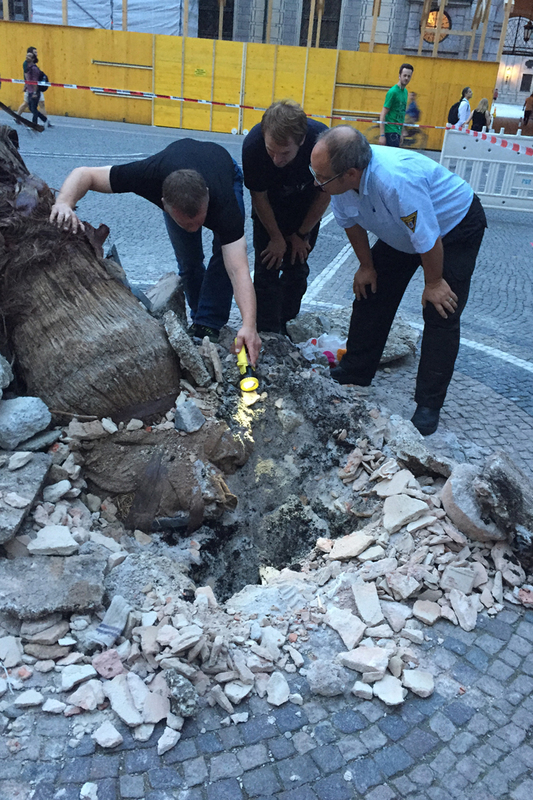 As a precaution the palm tree was temporarily closed off and fire brigade and city officials found out that there was a dangerous underground cavity under the medieval city square – probably due to erosion and water undermining. 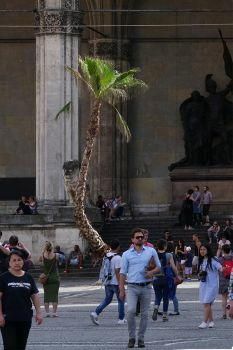 As it happens it was right next to the palm tree’s location. 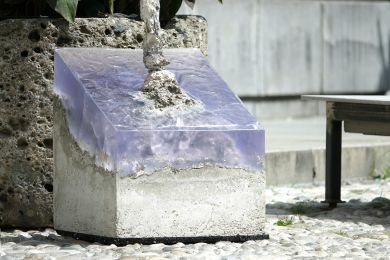 As a solution the subterranean cavity was filled up with fresh concrete. 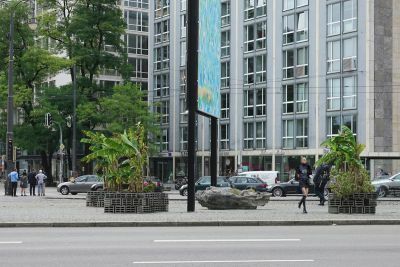 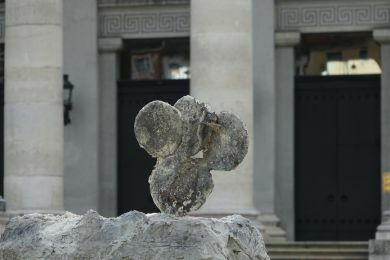 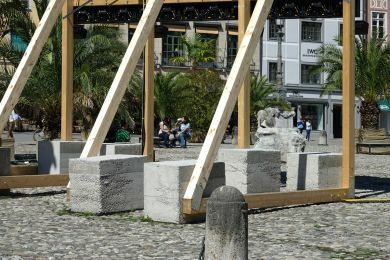 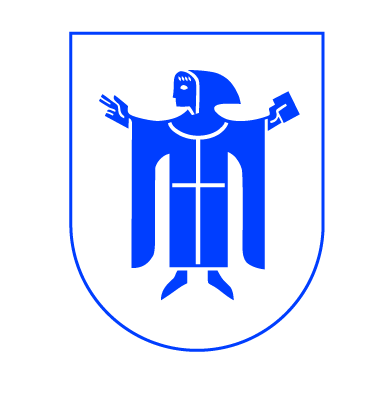 The situation of Lenbachplatz might be called archaeological. 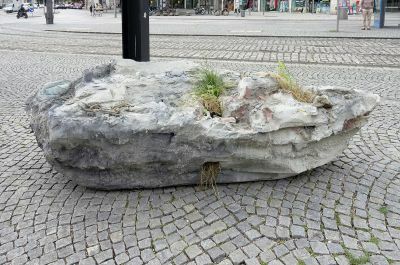 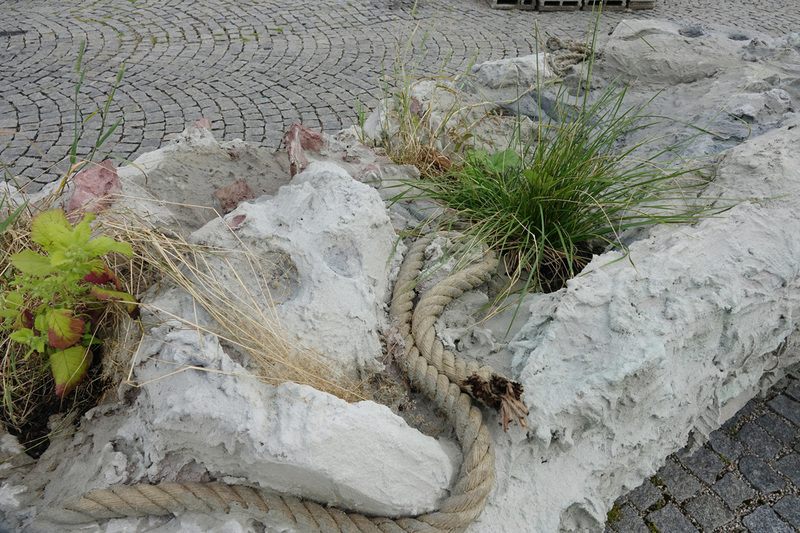 Like a petrified relic from a different or bygone world in which the flora was larger and strange, a peculiar concrete sculpture lies on the traffic island. 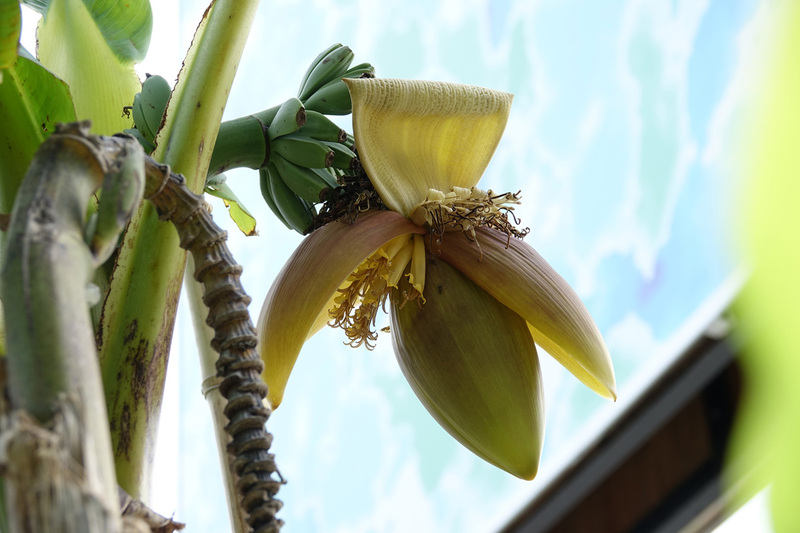 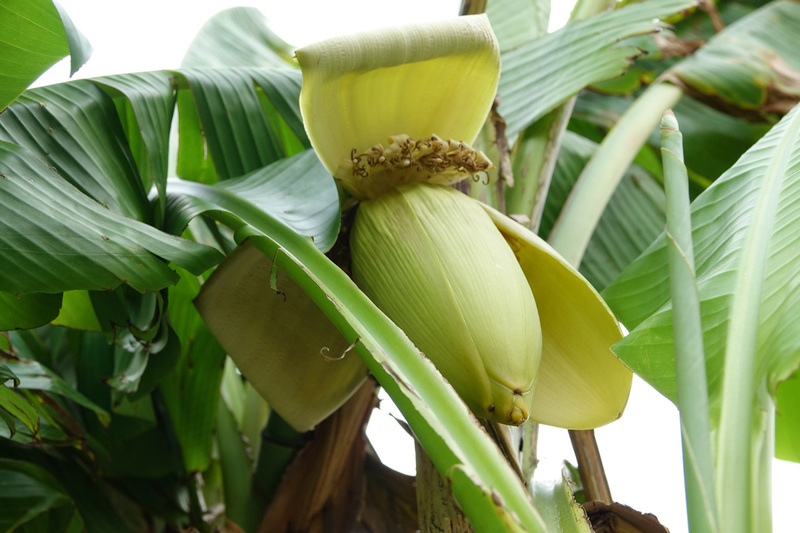 It’s surrounded by banana plants that shine all the fresher and greener by contrast. 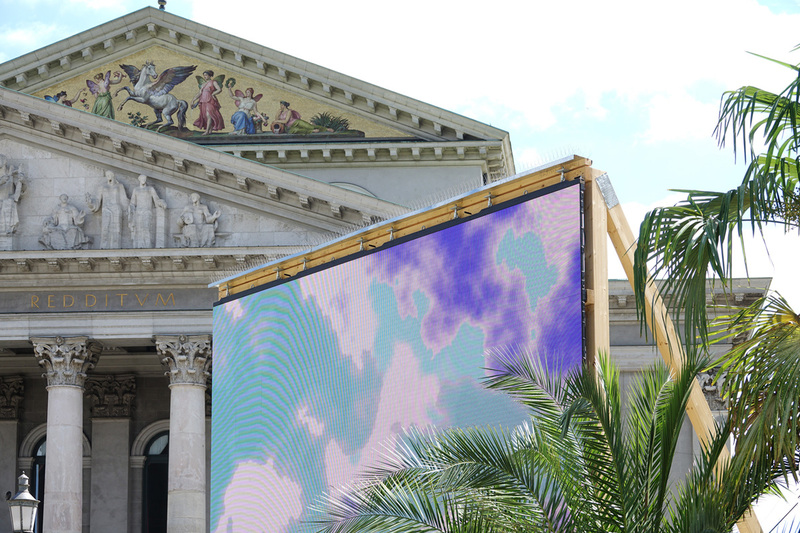 Towering above like a monumental archway is a huge billboard, showing a mysterious material in close-up. 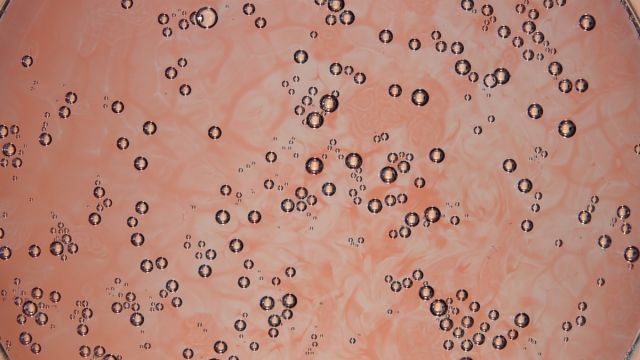 The biological structure is strangely fluid and thus assumes a scientific appearance: It is reminiscent of macro shots of chemical reactions and of crystal structures. 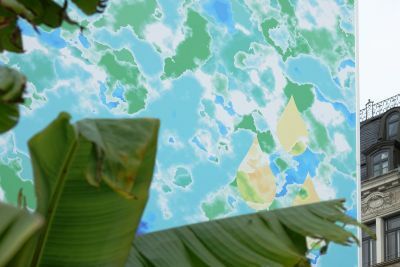 all images © Susi Gelb, 2017. 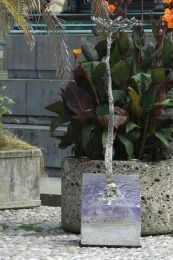 Courtesy of the Artist.